What’s in my Grocery Basket? Over the years, I’ve gotten lots of questions about cooking, but almost an equal amount of grocery shopping questions. It goes on and on. Sometimes I feel like more of a professional grocery shopper than chef. I spend SOOO much time in grocery stores. Heck, I worked in one for 3 years (Holla back Trader Joes!). The butchers and checkers at Whole Foods are my friends. They know my name, they ask about my dog, they tell me about their vacations. Let’s be clear… I go to the grocery store to HANG OUT. I’ve gone on dates with my husband to the grocery store. When I go on vacation, the places I most want to explore are the natural foods stores, coffee shops, and funky, alternative, and yummy restaurants. I will spend an hour in a store looking at prices and ingredient labels. Sometimes only walking out with 2 or 3 items. Without fail, I am in a grocery store everyday. My longest without has been 3 days… and I was so sick I couldn’t stand up without getting dizzy. 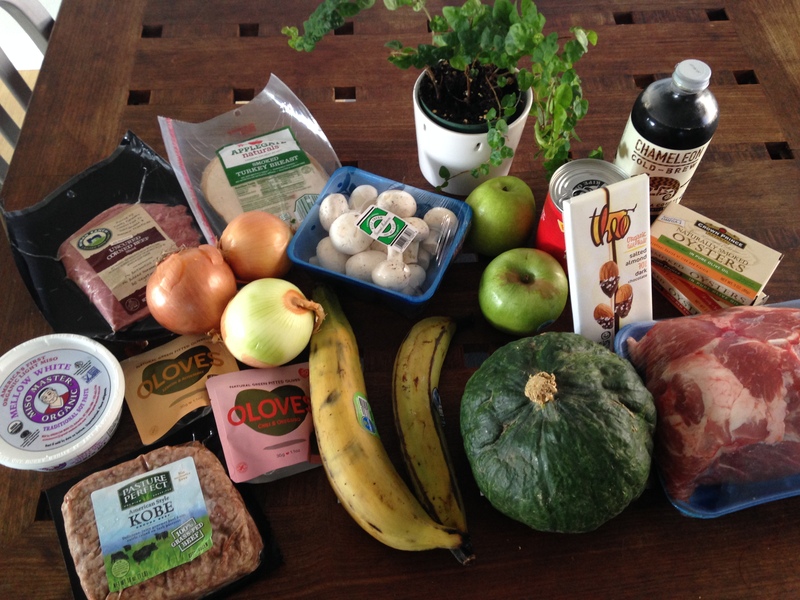 So I had the idea to share one of my weekly personal grocery purchases. I’m often in the store for ingredients for clients or recipe testing, but I love going in and getting stuff just for my husband and me. I usually don’t have a list. I have a general idea of what i need, but mostly I cruise around and pick stuff that sounds good, seasonal, inspiring, or maybe new and nutritious. All that being said, here’s the first installment of “What’s in my Grocery Basket?”. side note: notice I said “basket”. I literally NEVER use a cart. They drive me crazy because they are big and bulky and inconvenient. I’ve actually considered this when i think about having kids because i know that adding more people to my family may necessitate the use of a cart…. which could explain why I’m holding off. Just kidding. I just really don’t like carts. This is my first time in this store. It had recently opened right across the street from my mainstay, Whole Foods. But I decided to go check it out because I’d heard lots of great things about their international stuff. Plantains. God’s starchy gift to mankind. I haven’t had them in a while but I have a slow cooker of carnitas planned for this weekend, and plantains sounded like the perfect addition. Oloves. I’d seen these in Cost Plus World Market before. They are a great paleo snack that doesn’t involve nuts, fruit, or meat. I like to change it up and sometimes fruit and nuts just aren’t agreeable with my digestive system. So having a little pouch of olives with some seasoning is great. Warning… they do have some sunflower oil, which is unfortunate. Especially since they are OLIVES… hello?! why not just take them one step further and toss them in some olive oil. Seems obvious to me. Lindsay Black Olives. Same reasons as above just less packaging, wayyy cheaper, and equally delicious (and no sunflower oil). Theo Dark Chocolate with Sea Salt and Almonds. I like to have a little treat or something sweet everyday. Sometimes I’m into chocolate and sometimes I’m not. Right now is a chocolate time. I’m a HUGE fan of Theo. The chocolate is delicious and there is not soy lecithin in the ingredients. Also, the sea salt is great in this one. Crown Prince Oysters packed in Olive Oil. Usually I get these at Trader Joe’s (TJ’s), but Wholesome Choice (WC) had a bigger selection with more flavors, so I grabbed a spicy one to try out. The price was comparable to TJ’s. Another great paleo snack that is nourishing and nutrient dense. Defintely curbs any cravings. 3 onions. Cause I’m always using them for something and I knew I was out. They’ll probably get used for carnitas or caramelized for burgers, etc. WC: $.38 for 1.5 lb. Kabocha Squash. This is a favorite squash of mine. One of my favorite things about Autumn is all the SQUASH! Kabocha used to be only found in the Asian market. Then I started spotting it in Sprouts and Whole Foods (WF). It just recently made it into TJ’s and they also had some bumpy, ugly ones at WC. I love imperfect vegetables. Makes me feel like they were actually grown in dirt, but real people, with no GMO or chemicals, or other crap like that. Kabocha is awesome grilled or roasted. It’s sweet and dense (don’t eat too much or you will feel STUFFED). You can also eat the rind. Use it in place of pumpkin or squash in most recipes. Also, be advised that you need to have some upper body strength to cut into this bad boy. 5 lb. pink dumbbells won’t make the cut. Niman Ranch Corned Beef. Never had it before, thought I’d give it a try in my slider recipe with some onions and mustard. Applegate Turkey Meat. Comparable price to WF. I usually get fresh sliced meat there, and I never get deli meat from TJ’s unless it’s the black forest ham or pastrami. The sliced turkey and chicken always have fillers and sugars. No thanks. I’ll probably use these for sliders too. My new favorite thing is using turkey, apple (also seasonal! ), bacon, and homemade mayo in my sliders. Green Apples. For reasons stated above. Make sure to buy organic. Apples are on the dirty list. Mushrooms. My brother, father, and I are all devoted mushroom fans. I don’t like them raw, but love sautéed with garlic and onions and added to my eggs or as a side dish. I usually get shiitakes for soups or stir-frys. Never wash them with water, just brush off dirt with your hands, a paper towel, or veggie brush. Chameleon Cold Brew Mocha. As a devoted listener to the Balanced Bites podcast, I hear about Chameleon Cold Brew on a weekly basis. I love the taste but have only really indulged in this extravagance a couple of times. Reasons being 1. I don’t do well with caffeine. 2. It’s expensive. 3. I usually have my coffee cold and I feel weird about reheating a cold coffee product. I figured I’d give the new flavor a try over the weekend. Just for fun. Price was comparable to WF. Giant Pork Shoulder. future carnitas… ‘nuf said. Pasture Perfect Kobe Grass-Fed Beef. This beef is a life-changer. I had a butcher up in LA that carried this brand of beef and it is UNREAL how tasty it is. At 6.99/lb. it’s the same price as grass-fed at TJ’s and a little cheaper than WF. I was so incredibly stoked to find it at WC. It’s soooooooo delicious. Go find it and make a burger. Miso Master White Miso. No, not technically paleo, but a quality food product nonetheless. I love using miso as a flavor addition to sauces and dressings. Sometimes I’ll add it to soup if i need some extra nourishment. True miso is an ancestral food used widely in traditional asian cultures. It boasts lots of antioxidants, vitamin K, some probioitc, digestive enzymes. Since it is a fermented product, it is somewhat “pre-digested”. This particular miso is made from GMO-free, Organic Soy and rice. So it’s also gluten and dairy-free.